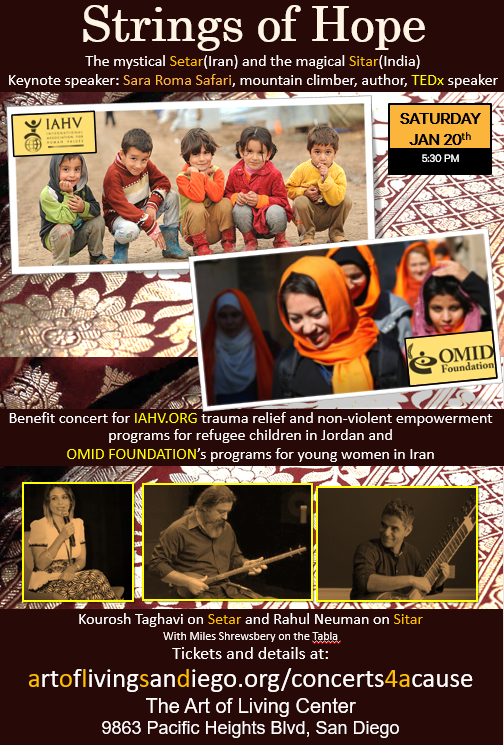 On January 20, 2018 a joint fundraising event benefitting OMID Foundation and IAHV.org, called Strings of Hope, will be held in San Diego, CA. IAHV.org raises funds to provide trauma relief and non-violent empowerment programs for refugee children in Lebanon and Jordan. This joint fundraiser will feature a keynote speech by Sara Safari, award winning UN Ambassador, along with a concert. 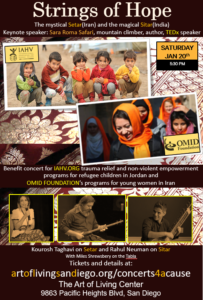 The concert will be multi-cultural including Persian and Indian musicians as listed in the official poster above. If you are in the San Diego area, please consider joining us. Please visit the Concert 4A Cause event page for more details and to buy tickets online. Click here to read more about Sara Safari’s recent visit and upcoming climb in Antartica to support OMID.